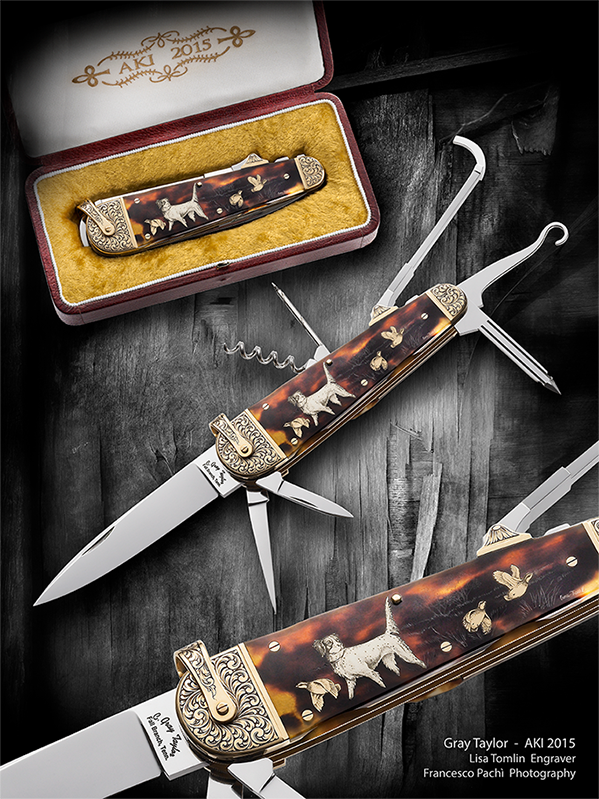 The knife has 2 cutting blades, hoof pick, giblet, corkscrew, manicure blade, buttonhook and awl. Master blade is a lock back. Blades are CPM-154. The bolsters, milled liners and screws are 14K gold. The scene was designed cut out and engraved by Lisa Tomlin, who also engraved the bolsters with fine English Scroll. The maker inlaid the scene into the scales. Overall size closed 4 3/4". Knife has 2 spear point blades, manicure blade, a pick and scissors. All are CPM-154. The milled liners, scalloped bolsters, bale and screws are 14K gold. The scales are exotic material with 14K gold pins and a floral inlay of pink and green 14K gold. The scene was designed and inlaid by the maker and shaded by Lisa Tomlin. Overall size closed 3 1/8". This knife has 2 blades and scissors of CPM-154. The milled liners, bolsters, bale and raised pins are 14K gold. 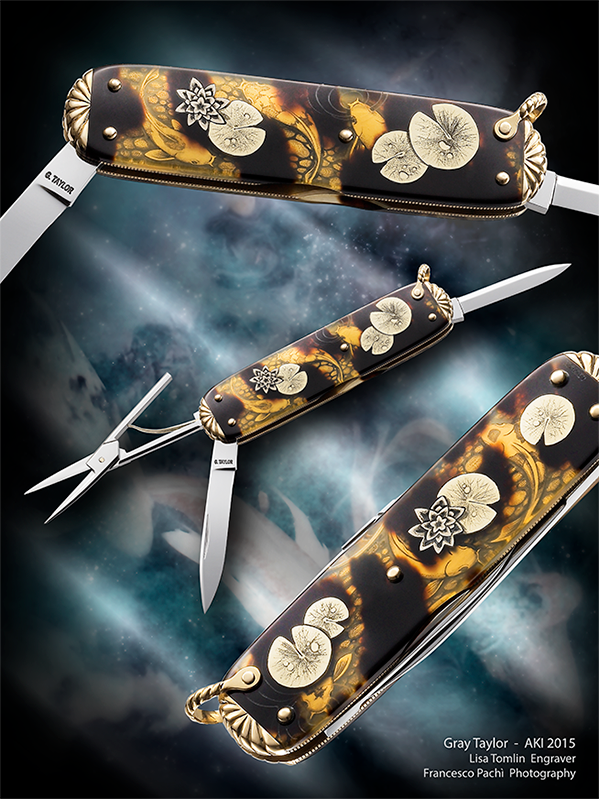 The scales are exotic material with a unique inlay design of white and green 14K lily pads and flowers and a 3D effect in which the koi are swimming under the lily pads and flowers. Lisa Tomlin designed and cut out the lily pads and flowers and engraved the fish. 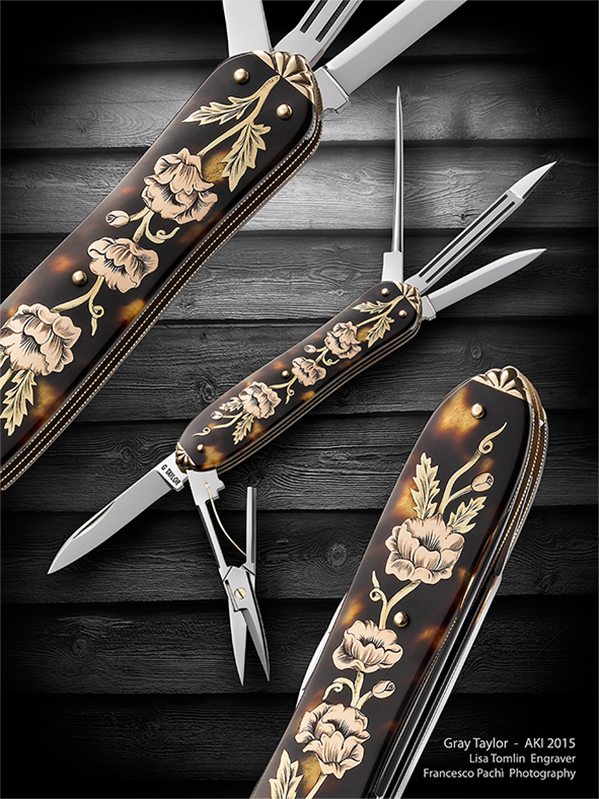 The lily pads and flowers were inlaid into the scales by the maker. Overall size closed 2 7/8" closed. Folding knives created by Mr. Taylor for the 2015 Art Knife Invitational. He was awarded the Buster Award for the fourth time at this show. 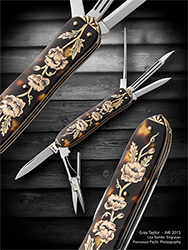 Each knife comes with a beautiful box covered with a beautiful box covered in goatskin leather and embossed in 22K gold. The inside of the box is stamped AKI 2015. Display boxes also by maker.